Our CBY Religious School recognizes that most of what we teach is either reinforced or lost, based on whether there is continuity in the home as an integral part of the student’s family life. To this end, we offer several opportunities for Parent Education, as well as activities for families to enjoy together. BOKER TOV – is a service at the end of most Sunday Religious School Mornings, led by Rabbi Bloom, and either our CBY Soloist Adriana Urato, or by our visiting Student Cantor when available. Boker Tov means “Good Morning!” in Hebrew. This service is an integral part of the Religious School day, and all students are expected to attend. We highly recommend that Parents come early for dismissal pick-up such that they can join us to attend this service as well! The service is brief, including a few traditional prayers, and often a theme, as a school-wide learning opportunity for both students and Parents! Most services begin at 11:30AM, but for a few Important Holiday themes our Boker Tov Service will be extended and begin at 11:00 or 11:15AM. The time for the Boker Tov Service will be posted when you drop off your students for class at 9AM. We hope you make plans to attend! PARENT BRUNCH AND LEARN – approximately once per month while students are in their classes, we invite parents to come in to socialize with other parents, and discuss a relevant topic with Rabbi while munching on goodies provided by our Religious School Committee. 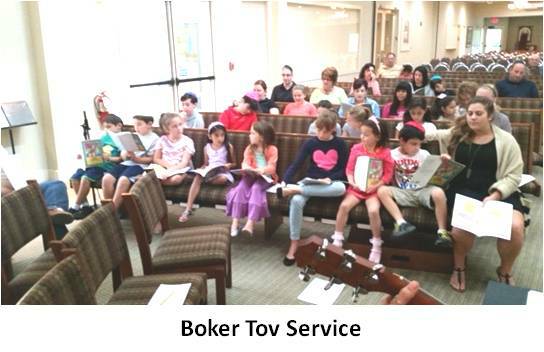 Then parents are available to enjoy our Boker Tov Service with their child(ren). Topics are chosen by the parents at the beginning of the school year. Information about these programs will be sent out in monthly reminders to our parents. As well, return to this page soon for the dates and topics that have been planned for the year. FAMILY SHABBAT AND HAVDALAH PROGRAMS – several times through the school year we invite our students and their families to attend a Shabbat activity, where students experience what they’ve learned in class. Many enable families to participate as part of the larger CBY community, in a child-friendly service. Some of our programs are actually led by students. More detailed information about these programs will be sent out in monthly reminders to our parents, and updated on our school calendar, as soon as these events are scheduled. As well, return to this page for a summary of dates and descriptions for these events. FAMILY HOLIDAY PROGRAMS – for High Holy Days, and a few other special holidays, the Religious School plans a separate experience for our Religious School families, geared to the level and attention span of our students. These include (at a minimum), Rosh Hashanah, Yom Kippur, Sukkot, Simchat Torah, Chanukkah, Purim and Passover. More detailed information about these programs will be sent out in monthly reminders to our parents, and updated on our school calendar, as soon as these events are scheduled. As well, return to this page for a summary of dates and descriptions for these events.